Tonight I took some time to send a submission in to the Joint Select Committee on Constitutional Recognition Relating to Aboriginal and Torres Strait Islander Peoples in support of the Uluru Statement from the Heart from the 2017 First Nations National Constitutional Convention held at Uluru. Submissions close June 11th so I wanted to get this in as I feel very strongly about this issue. The first peoples of Australia have lived as part of this continent for many times longer than the ancestors of James Cook lived in the UK(*), let alone this brief period of European colonisation called Australia. They have farmed, shaped and cared for this land over the millennia, they have seen the climate change, the shorelines move and species evolve. Yet after all this deep time as custodians of this land they were dispossessed via the convenient lie of Terra Nullius and through killing, forced relocation and introduced sickness had their links to this land severely beaten, though not fatally broken. Yet we still have the chance to try and make a bridge and a new relationship with these first peoples; they have offered us the opportunity for a Makarrata and I ask you to grasp this opportunity with both hands, for the sake of all Australians. Several of the component states and territories of this recent nation of Australia are starting to investigate treaties with their first peoples, but this must also happen at the federal level as well. Please take the Uluru Statement from the Heart to your own hearts, accept the offering of Makarrata & a commission and let us all move forward together. (*) Australia has been continuously occupied for at least 50,000 years, almost certainly for at least 60,000 years and likely longer. The UK has only been continuously occupied for around the last 10,000 years after the last Ice Age drove its previous population out into warmer parts of what is now Europe. 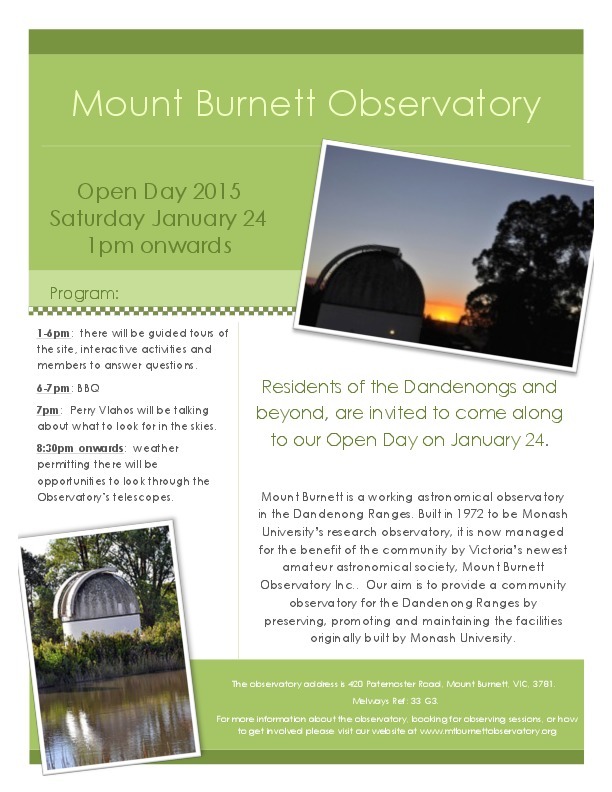 As some of you know I’m involved with the Mount Burnett Observatory, a community run astronomical observatory in the Dandenong Ranges of Victoria near Emerald to the south-east of Melbourne. Originally built by Monash University in the early 1970’s it’s 3 years since a small group of people formed a community association, took over the site and starting resurrecting it as an observatory by and for the people. It’s now three years on and by the end of last year we were the second largest astronomical association in Victoria! This Saturday (24th January) is our third birthday celebration so we’re having an open day running from 1pm through to 6pm with tours, activities, a solar telescope and components from the Murchison Widefield Array (MWA), one of the precursor telescopes to the massive Square Kilometer Array telescope project! At 6pm we have a barbecue and then at 7pm there will be a talk by Perry Vlahos on what there will be to see in the sky over the coming month. After that we’ll be socialising and, if the weather behaves itself, viewing the stars through the many observatory telescopes. 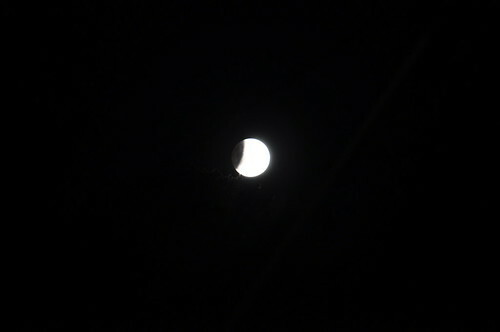 Tonight Melbourne got to experience the tail end of a lunar eclipse as the moon rose in eclipse at 17:48. 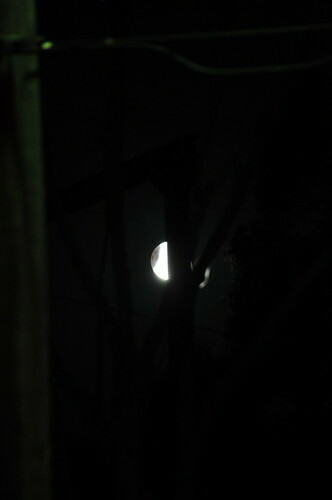 We took a friend on a trip up to the (apparently now closed) Olinda Golf Course to view the moon rise. It was nice and clear and after roaming around a bit to find a place where we should have been able to see the eclipsed moon we found a suitable spot but couldn’t see the moon itself. 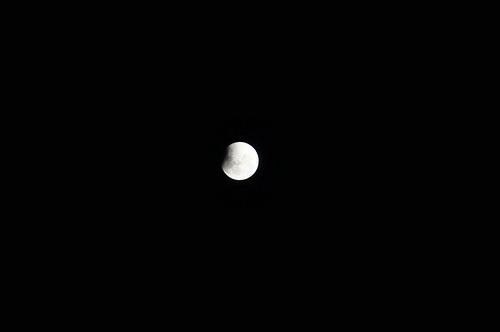 Mars was visible in the right area but of course the salient point of a lunar eclipse is that the moon is in the earths shadow and so wasn’t findable until it started to exit at third contact. Got a few photos, of which this was the best. 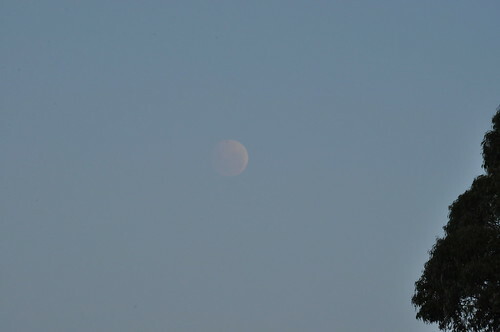 We had to head back down the hill as Donna had an appointment at 7pm but later on our friend called up and said excitedly “Have you seen the moon? Go and look!”. 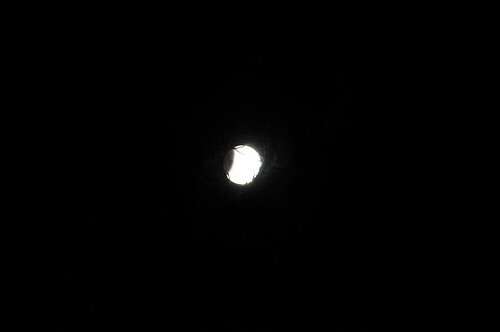 I went out to see but the hills were still in the way then, so later on I headed out with the camera once the moon was visible and got some more photos as the moon headed towards fourth contact (when it exits the shadow of the Earth). In relation to question 2, no, the unaccompanied Sri Lankan minors were not advised of their rights to seek asylum. Australian law does not contain a right to seek asylum, and therefore, departmental practice does not involve advising unauthorised arrivals that they have such a right. In other words, Australia’s own “Don’t Ask, Don’t Tell” policy, except this time in defiance of international agreements Australia itself helped forge. Australia was a founding member of the UN and played a prominent role in the negotiation of the UN Charter in 1945. Australia was also one of eight nations involved in drafting the Universal Declaration. This was largely due to the influential leadership of Dr Herbert Vere Evatt, the head of Australia’s delegation to the UN. In 1948, Dr HV Evatt became President of the UN General Assembly. That same year he oversaw the adoption of the Universal Declaration. (2) The protection of refugees who are minors, in particular unaccompanied children and girls, with special reference to guardianship and adoption. The Migration Act incorporates art 1A(2) into Australian domestic law, and gives effect to Australia’s obligation of non-refoulement—not to return a person in any manner whatsoever to the frontiers of territories where the person’s life or freedom would be threatened on account of his or her race, religion, nationality, membership of a particular social group or political opinion. Section 36(2) provides for the grant of a protection visa to a ‘non-citizen in Australia to whom the Minister is satisfied Australia has protection obligations under the Refugees Convention as amended by the Refugees Protocol’. The Convention further stipulates that, subject to specific exceptions, refugees should not be penalized for their illegal entry or stay. This recognizes that the seeking of asylum can require refugees to breach immigration rules. To me this seems to show that the Australian Government itself is either ignorant of its own legislation or just being deliberately misleading. Or both. None of which would surprise me at the moment. Now detaining someone indefinitely for exercising a recognised human right is not a behaviour you would normally associate with a democratic nation, especially not one that likes to think of itself as being the land of the fair go, of battlers and a nation founded by convicts from Britain (there had been people here for longer than the current continuous occupation of the UK, but that gets forgotten). If the Australian Government was really interested in reducing deaths at sea of refugees whilst abiding by the international conventions they had voluntarily signed up to they would be investing in ways to let people apply for asylum far closer to their native land so they didn’t need to travel, whilst keeping them safe, and ensuring that applications were processed rapidly, fairly and accurately. To me the fact that we don’t do that but rather imprison (let’s call it what it really is) the tiny trickle of refugees who do decide to come here means that the Australian Government isn’t interested in their welfare or dealing fairly with people looking from protection from persecution, it’s just interested in stopping people coming here full stop. They are, therefore, keeping these people in prisons for political purposes, to win votes at home and to stay in power. So I submit that the Australian Government is now in the de-facto state of keeping political prisoners, even to the extent of defying direct requests from the UNHCR to release some. Contemptible behaviour by our Class Bully for Immigration.. This role requires advanced skills in system and network administration and scripting, clustered computer systems, security, virtualisation and Petabyte-scale storage. It is highly desirable that you have acquired these skills in a Life sciences environment. The heterogeneous environment requires both Linux and Windows skills. You should have the ability to design and implement solutions for automated transfer of data within and between systems and to ensure the security of both internal and Internet-facing systems. In this complex environment, working closely in teams of multi-disciplinary scientists to deliver computing solutions, including advanced troubleshooting and diagnostic skills, will be required. Supervision of other members of the team will also be necessary.